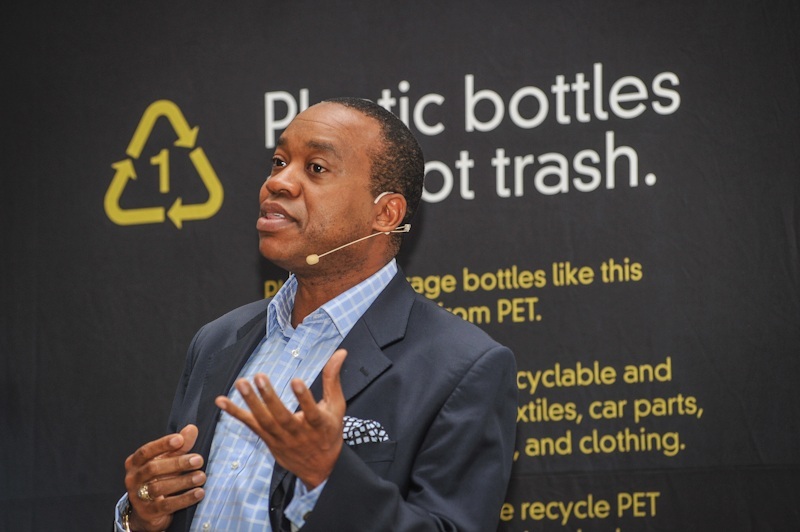 PETCO recently celebrated the best people, companies and organisations involved in post-consumer PET recycling in South Africa, at their 7th annual AGM and networking evening held at the Forum, in Bryanston, Johannesburg. The magical evening, which was not shaken by the devastating hailstorm that gripped the reef, took the form of a stylish cocktail and networking session with formal program of entertainment and top notch speakers, and aimed to reflect on PETCO’s previous year’s achievements, showcase best practice and inspire the industry to innovate, contributing to a sustainable future for all. Mbali Vilakazi, Soul Activist, Thinker and Poet, launched off the proceedings with a moving piece that artfully wove the story of recycling with a thread of “A chain reaction”, galvanising the audience to action, and reinforcing their important role in the chain. Mbali was followed by Cheri Scholtz, CEO of PETCO, who gave an overview of their activities for the year gone by showing that in 7 years of growing targets, collecting recycling levies, creating awareness amongst consumers and understanding end-use economics, PETCO is beginning to connect the dots! Those in attendance were motivated and stimulated by guest speaker Bill Egbe, Group Director, Sustainability, Strategy and Business Planning for the Coca-Cola Company’s Eurasia & Africa Group, who unpacked the sustainable approach to business and the true meaning of adding value. Bill unfolded the ‘sustainable approach’, drawing attention to the need to contribute positively to the wellbeing of communities, that of all stakeholders (not just shareholders) and that of the environment and planet. He emphasized that in building a business you should aim to be in for the long-haul, be resilient to changes and challenges and sustain success that it enduring. He then elaborated on the ‘How’ and ‘Why’ of a sustainable approach that adds true value. Renown Political Analyst, Daniel Silke, enlightened the attendees with his socio-political commentary titled ‘South Africa in Perspective.’ Daniel shared fascinating global statistics, drawing Africa, and in particular South Africa, into this global perspective. He ended off imparting a sense of optimism about our future and the unique space in which South Africans find themselves, where opportunities to innovate abound in creating sustainable livelihoods, delivering basic services, balancing socio economic factors and meeting the needs of the present. Having been inspired and motivated, the PETCO awards rolled out, with Miss SA International 2012 Helga Barkhuizen assisting in the certificate handover. 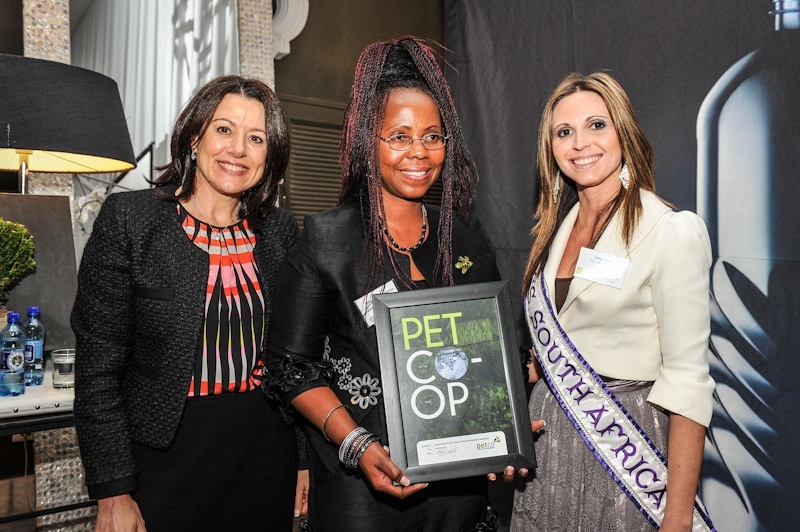 The awards celebrated the best people, companies and organisations involved in post-consumer PET recycling in South Africa. PETCO honoured cooperatives with the award of a certificate to Shirley Bahula-Ermias, President and founder of Tshwane YaMamelodi Secondary Cooperatives. This award is given to a cooperative that has proactively and effectively grown the volumes of PET recycled, creating employment opportunities, and promoting collection, maintaining quality environmental standards, adhering to fair labour practice and in general furthering the aims of PETCO. Tshwane YaMamelodi Secondary Cooperatives, which was founded earlier this year as a spin-off of a Mandela Day initiative, services the whole of Mamelodi. Each co-op has a compliment of 35 members of staff in each of its 5 zones. At present, they are servicing a 250 000 homes without any municipal help and have created sustainable employment opportunities for at least 175 locals. Cheri Scholtz, CEO of PETCO, aptly quoted the United Nations Secretary-General Ban Ki-moon saying that “Cooperatives are a reminder to the international community that it is possible to pursue both economic viability and social responsibility, and PETCO is proud to be able to showcase the efforts of our local community in taking charge of their wellbeing and creating sustainable livelihoods.” “We will continue to empower cooperatives as part of our Category B project model where we support initiatives and activities that do not necessarily increase the collection volumes of recycled PET, but contribute to the visible recycling of PET,” she added. 2012 is the International Year of Cooperatives, which highlights the contribution of cooperatives to socio-economic development, particularly their impact on poverty reduction, employment generation and social integration. Under the theme ‘Cooperative Enterprises Build a Better World,’ the Year seeks to encourage the growth and establishment of cooperatives all over the world. Individuals, communities, non-governmental and government agencies are encouraged to recognise the role cooperatives can play in helping to achieve the Millennium Development Goals. 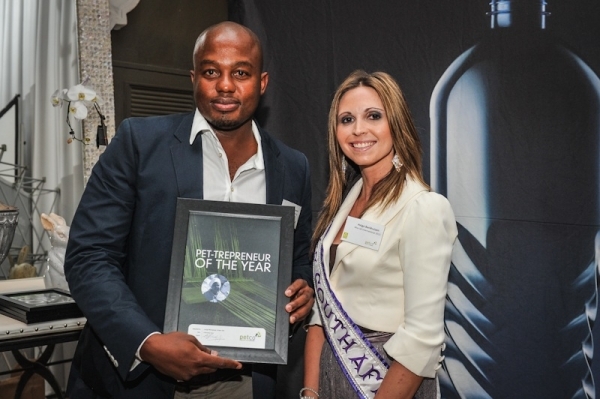 The line-up of award winners also included PET-trepreneur of the Year – Langa Mkhwanazi of Green Dot Recycling, who runs a collection company active in the Pretoria area. Langa is moving approximately 120-150 tonnes per month, achieving 142 tonnes last month despite the transport strike. Langa runs a 24 hour operation, working 3 shifts, he has 2 trucks, he employs 18 men and deals with over 1000 people daily. 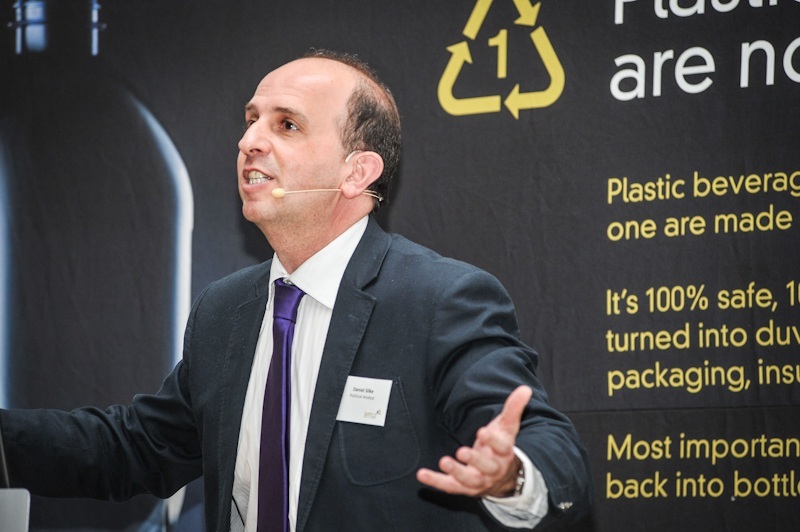 The PET Recycling Innovator of the Year award, was awarded to Fanus Beytell of Antiwaste. 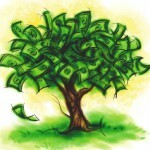 Fanus has developed a business model which is based on a combination of technology, market support and capacity building. The model involves the franchising of special cages for separation and storage of material in the different waste streams, a specially designed pickup truck with a patented loading mechanism to deliver empty cages on site and take the full cages back to the Materials Recovery Facility, working capital; signage; marketing support; safety clothing. PETCO recognises this as an ideal model for a co-operative to service an area on a highly labour intensive basis, and lauds Fanus’s efforts. The Corporate Social Investment Champion of the Year Award went to Amalgamated Beverage Industries (ABI) who believes the health and prosperity of the communities in which they operate is essential to their profitability and growth. In KZN, they have proudly supported the International Coastal Clean-up Campaign for the last 9 years, and launched the Schools recycling program, this year, to support efforts in township community recycling as well to drive a strong community message around education and the future of recycling in these markets. The project covers 120 schools across the ABI territory of KZN and Gauteng. They are also key sponsors of the Climate Hero Awards and support various organisations & Industry bodies such as Collect-a-Can, Food & trees for Africa, as well as PETCO. PlasticsISA’s John Kieser and Douw Steyn were delighted joint recipients of the PET Recycling Educator of the Year award. Between them these two individuals are active members of the Plastics Global Action Group on Marine Debris, the Electronic Waste Association of SA and the National Recycling Forum of SA. They are founder members and initiators of the Marine and Coastal Educators Forum, the International Coastal Clean-up SA, Clean-up SA Week and Recycling Day SA. They have initiated the Fantastic Plastic Schools Competition that has involved 20 000 learners in plastic awareness and recycling over the past 6 years. They have coordinated numerous exhibitions and workshops about plastics recycling involving close on 80 000 people per year. They have both worked for PlasticslSA for over 15 years and continue to motivate and empower people, young and old, across the country to take action. 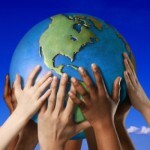 As with all recycling efforts, there will only be a demand for material, if there is an end use market for recyclate. “PETCO works hard to increase collection but also spearheads development and encourages the industry to innovate, developing viable end use markets” says Scholtz. This year’s PET Recycled Product of the Year was awarded to the locally-produced product that best reflects a commitment to using RPET, local production, quality and the promotion of rPET in product packaging and promotion. Fibertex – Betatex were amongst many candidates, but emerged winners with their extensive range of nonwoven geotextiles. They offer the Betatex range of nonwovens, made from rPET sourced locally, which is used for non-chemical applications in the building industry. Their product range also includes the Skudo Surface Protection range, which is a temporary covering that protects finished surfaces from construction site damages and spills. This is currently exported to the USA and is an interesting end use for the brown gingerbeer PET bottles. The awards ceremony drew to a close with the awarding of the Best end use PET market development of the year award. This honours a company that has developed a new end-use market for recycled post-consumer PET and has successfully commercialised this product in the marketplace. Extrupet walked away from the podium, award in hand for their Phoenix PET offering. Although initially produced in 2009, at the behest of Woolworths, this recycled polyethylene terephthalate resin was officially branded PhoenixPET on April 1st, 2012. The rise in green consumer consciousness and a need for local consumer brands and their retailers to display better sustainability credentials, justified Extrupet’s investment in creating the PhoenixPET brand. Noteworthy achievements thus far include Polyoak being awarded gold, in the “percentage recycled content” category at SAPRO’s “Best Recycled Plastic Product Competition” 2011. This award being for the 1,5L juice bottles produced for Woolworths. Not only did Polyoak receive this award, but they also received the overall “Best Recycled Plastic Product” award, in the same competition. Unilever SA was awarded a silver in the “percentage recycled content” category at this year’s SAPRO “Best Recycled Plastic Product Competition”, for their Sunlight Dishwashing Liquid bottle. Both bottles contain up to 25% PhoenixPET. Market response has been extremely positive, so much so that the demand for PhoenixPET exceeds supply. To this end Extrupet plans to upgrade its bottle-to-bottle (B2B) facility, in order to increase production capacity. PETCO will be watching this development with baited breath. Sheryl Ozinsky finally closed the evening quoting Donald Trump who once said, “You have to think anyway, so why not think big?” “South Africa is at a crossroads – we are a people with a certain past and an elusive future. In my opinion, the identity we seek will be discovered through entrepreneurial people for they are the prophets, going where others cannot” said Ozinsky, “….. And South Africa needs creative and entrepreneurial people, because the future will be made not by committees, cabinets and cliques, but by individuals such as those who have received awards here tonight. Non-conformists all, they are led by intuition and fed by imagination as they re-draw the maps and re-write the rules”. PETCO is proud to be a part of this chain reaction.